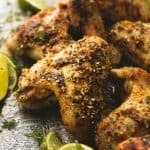 Easy marinated and grilled or baked jerk chicken wings are bursting with savory, spicy flavors that will leave you craving more. Combine oil, lime juice, green onion, habanero chiles, garlic, thyme, ginger, brown sugar, allspice, salt, and pepper in a food processor or blender and pulse until well blended. Reserve 1/4 cup of the mixture in a small bowl. Cover and refrigerate until ready to use. Transfer remaining mixture into a large resealable bag. Add chicken, seal bag, and chill for 3-8 hours. Grease and preheat grill OR preheat oven to 425 degrees. Remove chicken from bag, discard the bag and remaining marinade. Grill chicken 5-6 minutes on each side OR if using oven method, bake on a greased sheet pan for 15 minutes, then broil for 3-5 minutes. Brush reserved sauce over the chicken and cook 2-3 minutes longer on each side until cooked through. Garnish with chopped cilantro if desired and serve immediately.